STARS AND PAW PRINT WRISTBANDS ... These Fun and Exciting Stars and Paw Print Wristbands will be great to wear for any activity. Star and Paw Wristbands are Sold (2) per Package (one pair). These Terry Cloth Wrist Bands measure aprox. 3" wide, are Made of Heavy-Weight Plush Terry Pile Fabric, and feature Knit-In Stars or Animal Paws ... One Size Fits Most. 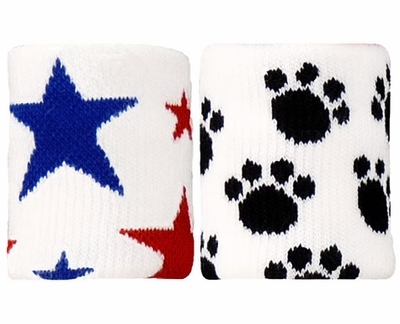 � White Wristband with Blue and Red Stars, � White Wristband with Black Paw Prints.